Inner Oasis is a soft skills fellowship designed to connect deep with self. 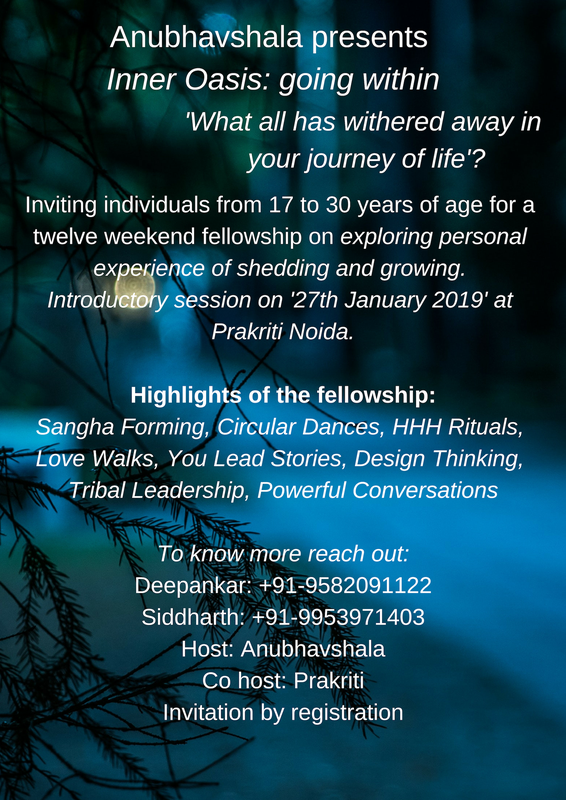 Its a program curated for individuals from 17 to 30 years of age (open till 35 years of age) where we will co-create the journey of experiential self and co-evolve as leaders in action. A retreat initiated with an intention to build brave spaces for individuals and collectives thereby helping each one to acknowledge, accept and express whatever is going on in life. Inner Oasis is about identifying our inner landscape- its terrain, flora and fauna. The fellowship is designed keeping in mind the holistic well-being of Self- Head, Heart and Hand. During the twelve weekends we will cross six suggestive milestones, design projects and implement it in our existing life scenarios. After the completion of fellowship there would be quarterly action plans through which we will support each others journey. Each weekend will be a deepening process of five hours of duration. The total contribution towards the fellowship is INR 8400/- only. Taxes as on actual basis. This will include meals, field-book and certificate of accomplishment. You can also play the role of a Secret Santa by sponsoring someone who you think would also need it the most. To know more attached is a detailed brochure, poster and a video link which will help you better in taking decision. The second free introductory session is happening on 27th January 2019 in Prakriti School Noida. Timings: 12 pm to 4 pm. Invitation is through registration so register here.